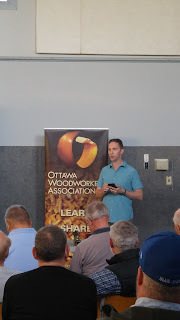 The next meeting of the Ottawa Woodworkers Association is coming up on March 5th. Let's hope the temperature rises some by then. If it does, don't forget your dry, warm, indoor footwear for the gym. As always, meetings run from 7-9 PM, but doors open at 6:30-ish for setting-up. It's in the basement gym of the Bethany Baptist Church at the Western intersection of Centrepointe and Baseline. If you're not a member, note that new members are welcome to attend up to two meetings, no charge, before making a commitment to join. The A La Carte menu includes tool swaps or sales, a 50-50 draw, members showing-and-telling, and who knows what else? And now for the Menu du Jour: Are you a Maloofophile? Then you'll be thrilled to learn our feature presenter, OWA member Dean Hummel, will talk about his visit to the Sam Maloof House and his building of a Maloof lounge chair with ottoman.